A common belief among the major religions of the world is the existence of a spiritual guide assigned to each person at birth. The mission of this supernatural being is to protect us and relay our prayers directly to God. This Guiding Spirit is universally known as the Guardian Angel. Have your prayers been falling upon deaf ears? Your Guardian Angel is by your side waiting to hear from you, wanting to help you. But he may have been waiting in vain if you have never learned the proper way to contact him, if you never learned the secret. How can you summon your Guardian Angel? 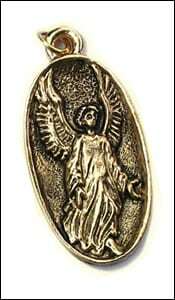 This powerful mystical amulet may help focus your attention on your own, personal Guardian Angel. As soon as you receive your 14 karat gold Guardian Angel necklace, a powerful new force may enter your life. You may immediately begin to feel his presence, his influence upon your life. Just as you keep images of your loved ones near you, you should always be near your Guardian Angel. Carry it with you or keep it in a quiet place in your home. Whenever you have a special prayer, request, or wish, focus your mind directly upon this remarkable amulet and speak your thoughts aloud. As soon as your Guardian Angel hears you he could immediately begin to work on your behalf. Now you may discover for yourself the peace of mind and happiness that comes from knowing that your prayers are not falling upon deaf ears. Your exquisitely finished in 14-karat gold Guardian Angel necklace could instantly become one of your most cherished possessions. In February I contacted you and asked you to send me the Guardian Angel and cast a spell to help me get more money. Well I won $5,104.00 in a sweepstake and it seems I keep on winning. I know I have God, you, and my Guardian Angel for my good fortune. I will get another spell cast as soon as I have the money and once agai. Thank you, love, and best wishes. is psychic, but is afraid of the things she has been seeing and hearing. It was totally consuming her life. Your special charm put her at ease, and her nightmares and visions have stopped. Thank you so much.